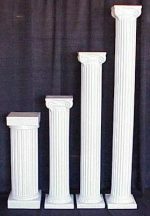 These columns are 72″ tall and have a nice flat pedestal top for displaying a variety of items. SKU: PAE12. Categories: Party & Event, Wedding, Columns. Tags: pedestal, wedding column. This plant box is a nice decorative add-on piece. Flowers are not included in the rental.